1 bedroom, 1 bathroom, sleeps 2. Comfortable and charming studio/efficiency cottage for two available spring through fall. Convenient to National Seashore's ocean beaches, bay beaches, and freshwater ponds. Easy access to bike and hiking trails, historic sites, shopping, and restaurants to suit any palate. While there's plenty to do and see in Eastham, it's just a short drive to Wellfleet, Orleans, and Chatham for theatre, movies, and more interesting shops and restaurants. Take in band concerts and Cape Cod baseball, too. The cottage has a warm, knotty pine interior with queen bed, kitchenette, dining area and bath with shower. The kitchenette is equipped with dishes, pots and pans, lobster pot, two burner stove, microwave, coffee maker, toaster and a compact refrigerator. Outside amenities include lounging chairs, hammock, picnic table, charcoal grill, and an enclosed outdoor shower. The cottage is air conditioned and heated and there's a flat panel TV with an abundance of cable channels. Wi-fi, too. Eastham, MA is very close to the National Seashore and has ocean, bay and pond beaches. This cottage offers easy access to the bike path which traverses Cape Cod and is also very close to many fine restaurants and shopping areas. There is a large flea market in nearby Wellfleet every weekend and also many fine Arts and Crafts shows. You can have a vacation filled with activity or a very restful relaxing and peaceful get-away. *Summer rentals are weekly, only (Saturday to Saturday). *Spring and Fall rentals require a 3 night minimum. * A 12.45% state and local tax will be incurred on all rentals from July 1, 2019 and thereafter. May and June rentals will not be taxed until 2020. The cottage is part of a 4 acre cottage colony with a total of 14 cottages. Parking in front of the cottage. Picnic table and outdoor seating for two. One step up to door. VERY peaceful location. Cottage clean and sweetly furnished and arranged. Great place and close to the National Sea Shore it is an excellent location to get to everything. My review is the same as above. The cottage was very cute and cozy the yard was filled with beautiful flowers and lots of different birds and cute bunnies everywhere. we had a very pleasant stay and are planning to return next year. Fabulous place for a break! We had 4 nights here in the middle of a 2 week driving holiday? It's brilliant! The cabin is very well equipped and clean. It's small but everything you need is there? The bed was comfortable and the shower is hot. We rented towels and bedding and they were perfect too. It's on a busy road (route 6) but you can't hear it when you get to the cabin? There are no shops for food in walking distance but the little supermarket at the cross roads was well stocked or you could turn right and head for Orleans? There's a big supermarket just off the roundabout? It's really easy to travel around Cape Cod from here since you're literally in the middle? We were lucky with the weather but be warned - if you're the type to get bitten you will?! Take some bug spray?! Lovely stay! 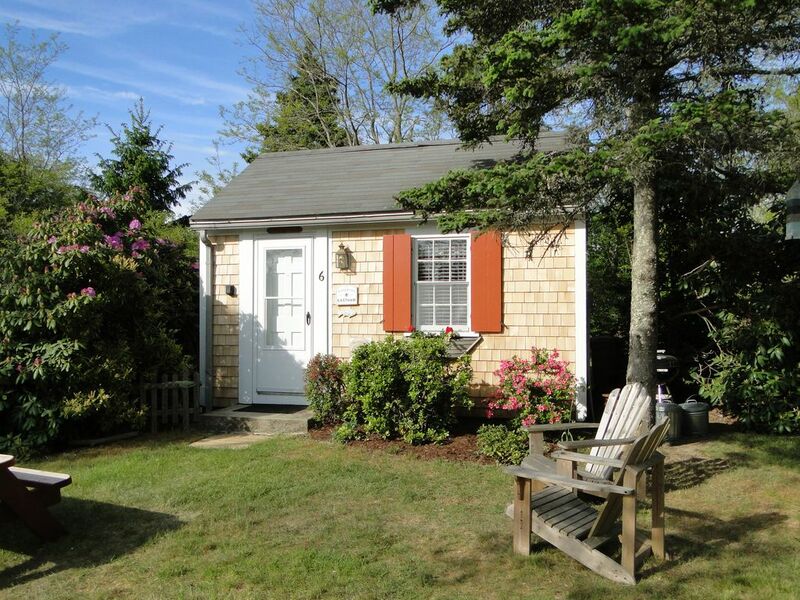 This charming cottage provided exactly what we were looking for and captures the feel of Cape Cod perfectly! It is ideally located for easy access to everything on the Cape, clean, well-kept and a quiet location. It had everything we needed and appreciated that bed linens/towels were provided for a small fee. Highly recommend and would stay here again! Glyn is great to work with and the attention to detail was appreciated. Saturday to Saturday rentals, only, during the summer season. Off season rentals require a three day minimum.